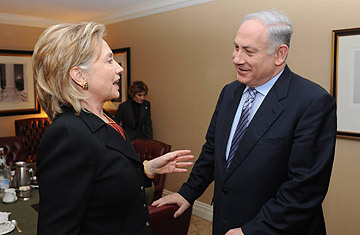 Prime Minister Benjamin Netanyahu talks with U.S. Secretary of State Hillary Clinton, March 22, 2010, in Washington, D.C. When Secretary of State Hillary Clinton addressed the Israel lobbying group AIPAC on Monday, one of her best-received lines was her vow that "the United States is determined to prevent Iran from acquiring nuclear weapons." Israel and its advocates in Washington see Iran's nuclear program, rather than the conflict with the Palestinians, as the prime issue in the U.S.Israel conversation. So Clinton talked up the Administration's efforts to halt Iran's uranium-enrichment program, citing "a growing international consensus on taking steps to pressure Iran's leaders to change course." Europe was on board, she said, and Russia wasn't far behind. "And although there is still work to be done, China has said it supports the dual-track approach of applying pressure if engagement does not produce results," Clinton added. "We are now working with our partners in the United Nations on new Security Council sanctions that will show Iran's leaders that there are real consequences for their intransigence ... Our aim is not incremental sanctions, but sanctions that will bite." The actual level of progress on the Iran sanctions front, however, has not yet caught up with Clinton's tough talk  and there's little sign that any of the pressure being mustered will realistically stop Iran from slowly acquiring the means to create a nuclear bomb (though the U.S. believes Tehran has not yet decided to actually build such weapons). Even if Europe were unanimously on board  it isn't quite, particularly on the unilateral sanctions with which the U.S. wants to supplement U.N. efforts  Russia has yet to offer any clear support for new sanctions. And even while Secretary Clinton was in Moscow last week, the Russian government affirmed that it intends to fulfill its contract to bring Iran's Bushehr nuclear reactor online in June despite U.S. objections. China, for its part, is not just playing hard-to-get on sanctions; it believes that Iran's nuclear program represents no imminent weaponization threat and that a lot more time must be allowed for dialogue in order to bring Tehran into full compliance with its obligations under the Non-Proliferation Treaty (NPT). Despite Clinton's suggestion that Beijing supports the idea of parallel tracks of pressure and diplomacy, Chinese officials have repeatedly warned that sanctions could undermine prospects for a diplomatic solution, and has refused to consider the adoption of new measures at the Security Council. Beijing's opposition to new sanctions is shared by other Security Council members such as Brazil, Lebanon and Turkey. With Iran having refused to accept the terms of an international offer to exchange most of its enriched-uranium stockpile for reactor fuel, the Obama Administration had hoped to up the ante with new U.N. sanctions by February. But diplomats say June is more likely the earliest point at which the Security Council could be persuaded to act. And even in the best-case scenario, new U.N. sanctions are unlikely to carry the "bite" promised by Clinton  measures that would inflict sufficient pain on Iran to change the calculations of its regime. That's why the U.S. is also moving to adopt "coalition of the willing" sanctions in conjunction with European allies  and, they hope, with support from Arab countries, although it's unclear whether such support would be forthcoming. The purpose of such measures would be to punish third-country companies doing business with Iran. A number of Western oil companies have recently stopped supplying gasoline to Iran in anticipation of such measures, suggesting they could be more effective than U.N. sanctions. But the Administration is also concerned about hurting ordinary Iranians, or shattering whatever international consensus currently exists on dealing with the Iran issue. And opposition to sanctions by many of Iran's neighbors and key trading partners would likely soften the impact of unilateral sanctions. Hopes that a change of regime in Iran would somehow break the nuclear stalemate have dimmed, with the authorities having successfully contained the challenge of the Green Movement (whose leaders, in any case, publicly backed their country's nuclear program). And despite President Obama keeping the proverbial "all options" on the table, the U.S. military leadership is opposed to trying to resolve the nuclear standoff by force: Bombing Iran's facilities would likely only set back its nuclear program by a few years (and make weaponization more likely), goes the reasoning, at a cost of a possibly starting a calamitous regional war. So how does the Obama Administration make good on its promise to prevent Iran from acquiring nuclear weapons? One of Clinton's predecessors, former Secretary of State Colin Powell, has some unsolicited advice: "I don't see a set of sanctions coming along that would be so detrimental to the Iranians that they are going to stop [their nuclear] program," Powell said in an interview with Bloomberg TV to be broadcast next weekend. "So ultimately, the solution has to be a negotiated one." The Administration may have decided that engagement was tried, and failed, when Iran refused the terms of the reactor-fuel deal, but others  like the Chinese  believe the negotiations route has a long way to go. The current deadlock suggests that Iran is unlikely to accept the terms currently on offer by the West for resolving the dispute, but that doesn't necessarily preclude any deal  Iran has floated a number of counter offers for exchanging smaller amounts of uranium or storing it on Iranian soil, but none of these has so far been acceptable to the U.S. and its allies, whose stated objective remains ending all uranium enrichment in Iran. Tehran has held firm to the principle that the NPT allows it to enrich uranium for energy purposes, under international scrutiny  and it has been willing to go to the mat to defend that right. "The Iranians are determined to have a nuclear program," Powell told interviewer Judy Woodruff. "Notice I did not say a nuclear weapon. But they are determined to have a nuclear program, notwithstanding the last six or seven years of efforts on our part to keep them from having a nuclear program." Powell may be subtly urging the Administration to adopt a more flexible position on Iran, but some powerful domestic interest groups are urging it to do just the opposite. AIPAC activists swarmed Capitol Hill on Tuesday to lobby legislators to push the Obama Administration to take an even tougher line on Tehran. So, as things stand, Secretary Clinton  or whomever the Administration taps to address next year's AIPAC policy conference  may not have much progress to report on the Iran front.